Why? Strongman is a neural sport therefore ensuring adequate recovery is of paramount importance. 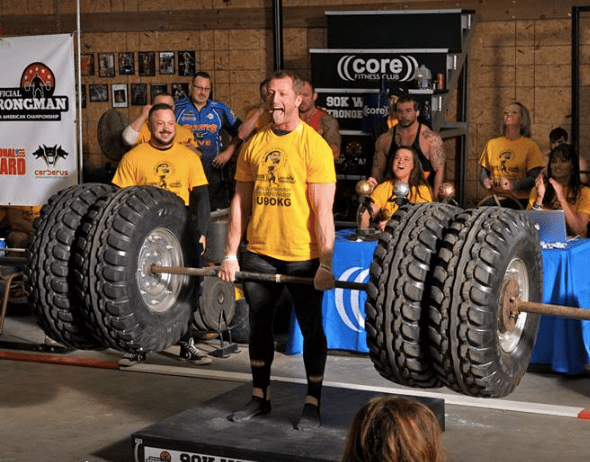 Remember, in Strongman/woman, what you do in the gym has a direct effect on competition performance. It’s not like a 100m sprinter, where they have to also complete technical work alongside strength training. So in essence, the better your performance in the gym, the better your performance in competition. A 3rd day in a row will simply lead to sub-par training, which will lead to sub-par performance. It’s a question of quality over quantity. Why? A chain is only as strong as its weakest link. Balance between the predictor lifts will improve your performance more than becoming a one lift wonder. *Principles are not rules. They’re not set in stone. Weekend Rest: Most people work Monday to Friday, so having your training set out like this still leaves you plenty of time for family activities, trips away. Yes, Strongman is important, but having balance in your life even more so. In addition, not being at work enables enhanced recovery due to less stressors and more time to used advanced recovery methods. 2 Days Complete Rest: I have found having 48 hours with no training to have a huge effect on overall recovery, enabling a higher output when returning to the gym on the Monday. Saturday: Although I prefer the above option this option enables you to take advantage of doing a longer event session, or even splitting the day into 2 sessions. Another advantage is the possibility of traveling to other gyms to train with stronger or simply like-minded individuals. Placing Push Press here means you will be performing the movement requiring the highest amount of coordination when you are fresh. Arguably, this a full body day as you’ll be cleaning and pressing the Log/Axle/Dumbbell, not just pressing it. This day should not be neurally fatiguing or muscle damaging to the point you are sore or tired for the following day. If it is, I would assume technique limitations in the clean and push press. After the deadlift, the strict press is the most neurologically demanding movement you’re going to have. Hence the need for 24 hours rest before I recommend completing it. Remedials to add in include shoulder stabilizers and grip work. I don’t believe every Saturday needs to be a long events session. I prefer utilizing two or even three small sessions within the day, rather than the traditional 4-6 events session. Usually more talking than training is actually happening on these days anyway. Obviously, your priority will change according to the upcoming competition events you have to prepare for, but this will give you a good few tips to help you adjust your own training.